The word tobikko is derived from two Japanese words, Tobu meaning to fly and Ko meaning egg. 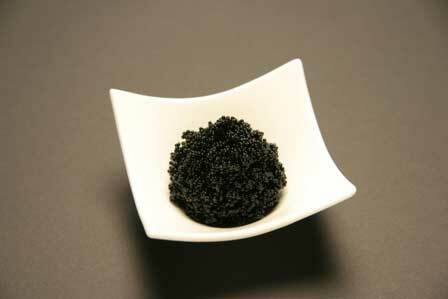 Knowing this, it should not come as a surprise to learn that the roe used to produce the various flavors and colors of tobikko caviar comes from the fish whose common name is "Flying Fish". While flying fish inhabit most of the world’s oceans, the roe for this product originates from the coastal waters of Taiwan. Flying fish lay their eggs in masses on various kelps and seaweeds. The industry associated with the collection of this roe has, over time, cultivated areas of seabed into areas that are ideal spawning grounds for the flying fish. By transplanting the most desirable forms of kelp and seaweed into these areas, they attract the flying fish into their "farms", making the harvest that much easier by localizing the highest concentrations of roe. The seaweed is harvested by machine and the eggs are carefully scraped off. Unprocessed eggs, which are a dull golden yellow color, are frozen and shipped by sea to the United States for processing. Once there, they are cleaned, seasoned, and colored. Tobikko caviars have the distinctive firm texture and clean resilient shine that adds a flair to any dish, while the variety of styles and flavors available provide the versatility needed for use in many different applications.